Home > WHAT IS YOUR FORMULA? YOUR EQUATION? YOUR ALGORITHM? Within minutes we had hatched an Edge-Serpentine collaboration for a "World Question Center" project, to debut on Edge during the annual Serpentine Gallery Experiment Marathon, the weekend of October 13-14. The plan was to further the reach of Obrist's question by asking for responses from the science-mindedEdge community, thus complementing the rich array of formulas already assembled by the Serpentine from distinguished artists such as Marina Abramovic, Matthew Barney, Louise Bourgeois, Gilbert & George, and Rosemarie Trockel. 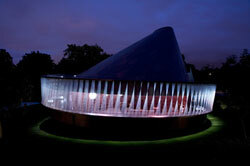 In addition to the online publication of "Formulae for the 21st Century," Edgewas invited to program four hours of the twenty-four hour Serpentine Gallery Experiment Marathon. 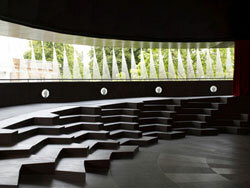 The event, which took place October 14th, was held in The Serpentine Gallery Pavilion 2007, commissioned by Serpentine Director Julia Peyton-Jones and designed by Olafur Eliasson and Kjetil Thorson.